Hey, that's my Family Room. How fun. "The classic combination of black and white can range from country to crisp and modern, but it's always effortlessly elegant. Here are our favorite black-and-white looks from talented homeowners of Rate My Space...Animal Magnetism, It's a classic decorators trick, add just a little animal print to spice up an otherwise ultra-sleek room. Designed by RMS user, S.Macklem". Wow! Kudos for being recognized by the top of the heap - HGTV!! Well deserved compliments for your obvious talents! Congrats! Congrats to you! 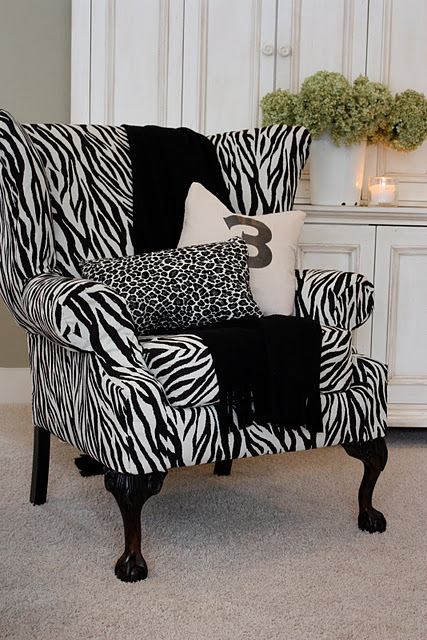 I love the zebra chair and I wonder if that is the one I have pinned, I'll have to check! You are so incredibly talented! I LOVE this look and what an awesome honor to be featured on HGTV!! Congrats! What a nice surprise right? I wish I'd live the same dream one day! LOL! OH! So fun and very exciting. It's a well designed room. You deserve the praise ;) Enjoy! !